If there’s one thing Roland Emmerich knows how to do, it’s how to make a bad movie. Even his best movies are bad, we just love them anyway and no one can really explain why. Universal Soldier, Stargate, ID4, Godzilla, The Patriot, The Day After Tomorrow, 10,000 BC, 2012, White House Down, Stonewall, Independence Day: Resurgence; he even has a Stargate reboot in the works, a movie called Moonfall that sounds like Armageddon in production, and an Independence Day 3 coming out in 2018. Holy moly, those are some bad, epic, action-packed, sci-fi extravaganzi. Not that you can’t pick out a couple from that list and say that you enjoyed them, because we all can, but that doesn’t make them good. The original Independence Day film is just that, enjoyable but pretty terrible, a summer blockbuster I dug as a kid but can’t be too proud of today. Something large is coming Earth’s way, and it doesn’t seem friendly. A giant mother ship is hovering in near-space, its smaller ships deployed over a handful of major cities around the world, its mini-ships protecting all from hostile contact. When the attack begins, several cities and thousands of people are wiped off the map, prompting the governments of the world to go into lock down. The American president, Thomas Whitmore, gathers his forces in a bunker in Area 51, desperately attempting to survive a much more advanced alien technology. Lucky for him, Captain Steve Hiller is a crack pilot and engineer David Levinson knows computes like the back of his hand. Together, they will strike at the enemy with the only weapon that the aliens don’t have; the human spirit, a force which fuels our survival when are backs are to the wall. 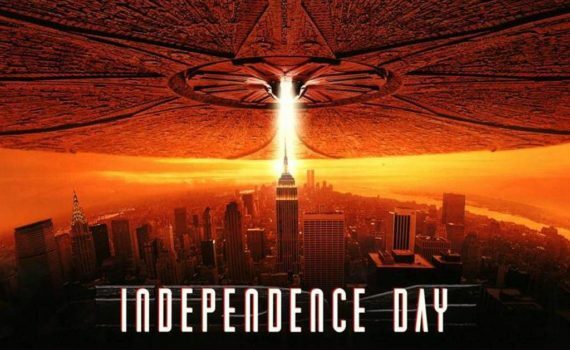 Silly but fun, Independence Day will always be an icon of the 90s, a must-see at the time that remains a prime example of what a blockbuster can do. It’s not wonderful, the acting is sometimes awful, it relies way too much on explosions to impress us, but you walk away having had a good time, and that’s all that was intended, after all. This was Will Smith’s first big movie after finishing Fresh Prince, starting a career that needs no introduction, as it were. He’d go on to be a superstar, all thanks to this movie. For Jeff Goldblum, who had already been cemented by Jurassic Park, this role lent credibility to the film and showed that he was a name people would pay attention to. The rest of a cast is a mix of A- and B-listers who you can make a game out of finding & naming: Judd Hirsch, Randy Quaid, Vivica A. Fox, Harvey Fierstein, Harry Connick Jr. They are all pieces in an over-the-top puzzle that blows up aliens, flies jets, cracks jokes, suffers loss, and comes out winning in the end. Although, I wonder what a first-time watcher might say.